The dogs surround me when I make Chinese pork jerky (bak kwa), shoving each other out of the way, so I can see their “Gimme, gimme, pleeese” expressions. They always get some but I figured I should make the doggy version a little healthier. 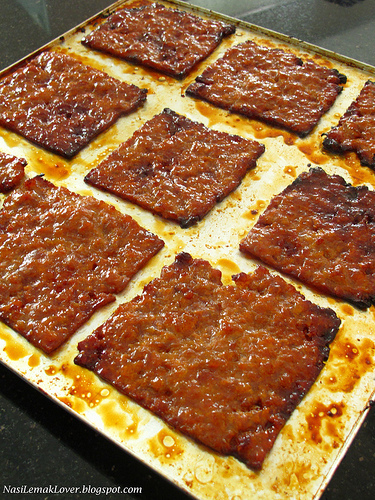 I can’t do away with the sugar and honey as the beauty of bak kwa is the caramelised flavour, but I can tweak the amount of sugar and cut back on sodium. It’s still not a treat dogs should eat every day, but it can’t be unhealthier than pet shop treats that come from dubious sources. At least I know my pork jerky has no preservatives and is made with love. I hear that commercial bak kwa is made with as much as 30% fat, so it stays springy. I prefer to keep within the 10% fat limit for a chewier texture. This means watching grilling time as the protein can turn too hard. Can you resist this? I can because I don’t eat meat, but it’s enough to start my carnivore friends drooling. Here’s Sonia’s recipe, but customised for dogs. 1. Put all ingredients in a big bowl and mix with a pair of chopsticks or your hand. Keep turning and stirring the mixture in one direction until the meat feels gluey. Refrigerate for several hours or overnight. 2. Line a baking tray with aluminium foil (for easy clean-up) and spread enough minced pork to make a thin layer. Use your fingers to press and a small rolling pin to smoothen the top. 3. Bake in a pre-heated oven at 160˚C for 15-20mins. Remove from oven. Increase the oven temperature to 240˚C. 4. When cool enough to handle, cut into small squares with kitchen scissors or pizza cutter (I prefer scissors so as not to damage the foil) and arrange (bottom-side up) on the same baking tray. If there’s any marinade in the tray, brush this on the jerky squares. 5. Grill (top heat only) at 240˚C for 10 mins. People who like charred edges can flip the pieces and continue grilling for another 7 minutes. Not necessary when cooking for dogs. 5. Grill (top heat only) at 240˚C for 10mins. People who like charred edges can flip the pieces and continue grilling for another 7 minutes. Not necessary for dogs.